Hi friends! It seems I took a little unexpected, but much needed hiatus. How have you been? 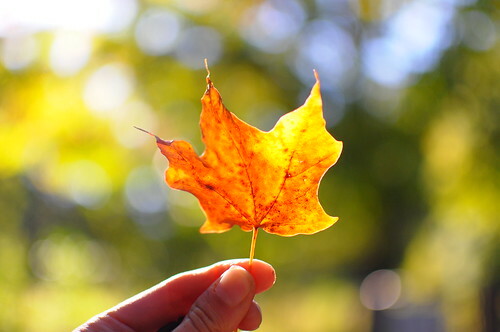 Yesterday was my favourite kind of fall day. When I left the house early in the morning, I was chilly and bundled up in a sweater. By the afternoon, it was hot and sunny. I took Maisy to High Park and as we walked through the forest, I realized that I hadn’t told you about the t-shirt I was wearing. It’s the first t-shirt I’ve sewn and I made in it our T-Shirt class. 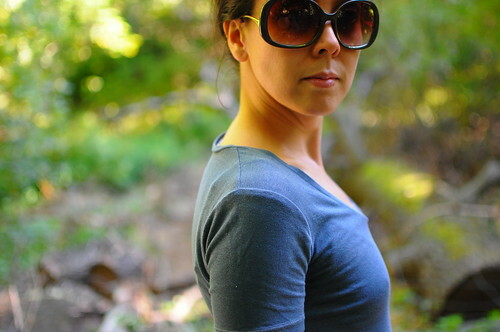 I’m still pretty new to sewing with knit fabrics, so I was thrilled to learn to make myself a perfect fitting tee completely on a serger. (Actually, we also use a cover stitch machine in this class, as well!) There are several different neckline and sleeve length options to choose from with this pattern. I combined the v-neck and the jewel neck to make a deeper scoop neck which I quite like. 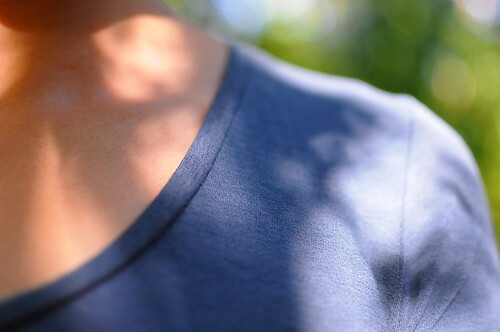 The fabric is a blue jersey I already had, but my next tee will definitely be made out of bamboo jersey. Now that I’ve got this pattern, I’m pretty set with all the basics. (Underwear + Tees) I’m going to draw the line at making my own jeans, but I’ve got a hankering to try making a pair of shoes one day. 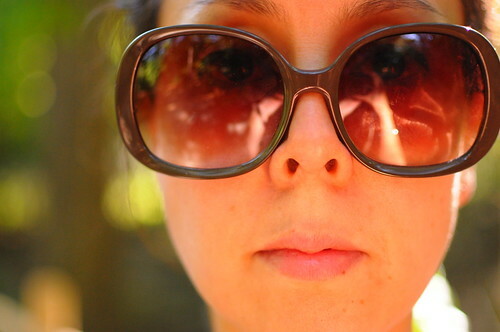 I’m also sporting my new sunglasses (on sale from Anthropologie) in these photos. I went to New York City a couple weeks ago for the weekend. I have some fun photos to organize and post up for you. The t-shirt looks great! What pattern did you use? Looks great! I was just trying on some ill-fitting cheep-o t-shirts a store and reminding myself that I must take that class and learn to make them myself–a perfect T is such a stand by (like jeans!). Karyn, it’s so pretty and perfect! It can be surprisingly difficult to find a t-shirt just the way you like it so it’s amazing you can whip up your own anytime! Yes, please, what pattern did you use? your seams and the neckline are so perfect and it fits you so well! purrrrrrty! I love the colour too! I still have to finish the hems on mine. the shirt is just gorgeous on you! so pretty! you are going to LOVE the bamboo jersey. i especially love it for underwear – soft, stretchy and sedate colours. would love to know what pattern you used for the t-shirt. wish i lived in toronto – i would take the class. the shirt is so pretty. i wish i could handle jersey. need more practice. Love the tee, love the shades! Is there anything Anthro can’t do? Great job on the tshirt! It looks great! I really wish I lived near your shop… I would take all the classes you offer!! what pattern did you use for your tshirt?